London, UK, Monday 25 February 2019 – Hermes Logistics Technologies (HLT) continues to expand its teams in India and the UK as their flagship cargo management system (CMS), Hermes 5 (H5) is adopted by cargo ground handlers, airlines and airports across the globe. Specialised staff in the Development, Cargo and Quality Assurance teams, will build on Hermes’ all-round capabilities in creating new technologies, applications and business analysis with the Customer Service team providing support. “We are growing our teams in India and the UK to allow us to continue the development of new applications as part of our Hermes NG suite which will complement H5’s software as a service (SaaS) Cloud offering,” said Yuval Baruch, Chief Executive Officer, Hermes Logistics Technologies. Atul Kumbhare joins the team bringing 20 years’ industry experience to Hermes’ India office in Pune, where he will lead the development team and work with Manager and Head of Quality Control, Sachin Gokhale whose career in project management and process implementations also spans nearly two decades. The UK office has welcomed Nishant Singh and Steve Palmer who will contribute a combined experience of 43 years in global digital system architecture to work on the development of Hermes NG, with the support of new staff set to join later this year. “As Hermes continues to develop its core products to meet the demands of a growing customer base, we are pleased to welcome new members to our global team to provide support and innovation to our digital solution portfolio,” said Alexis Labonne, Chief Technology Officer, Hermes Logistics Technologies. Hermes NG, a modular, pay-as-you-go cargo management system which gives functionality across devices began development in 2018 and goes to trial later next month. The latest implementation of H5 took place at Luxembourg Airport for LuxairCARGO when the first phase of the CMS was completed at the end of 2018, and the second phase is set for deployment in Q2 this year. H5 has a fast-growing presence in Asia following the success of its first implementation at Hanoi Airport, Vietnam in April 2018, it will soon go-live at Dubai World Central with RSA National and Hyderabad Airport, India, where HLT signed a five-year contract with GMR Group to provide rolling upgrades to the system. H5 has also been adopted by UASL (Ultramar Group) at Santiago Airport in Chile, and by LUG at their newly acquired Hamburg terminal. 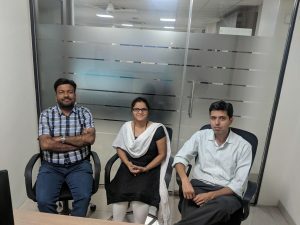 Atul Kumbhare (left) joins the team at the India office in Pune, where he will lead the development team and work with Manager and Head of Quality Control, Sachin Gokhale (right) with Dipali Zinjad, Domain Expert, pictured centre.